I’ve been spending a lot of time playing Destiny over the last two weeks. I’ve been spending even more time just trying to figure out what I think of it. 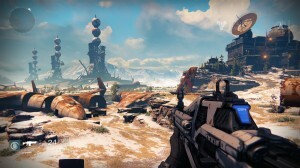 For those who aren’t familiar, Destiny is a new FPS (first person shooter) mixed with elements of MMO (Massively multiplayer online) and RPG (role-playing game) from Bungie, the studio behind the juggernaut Halo franchise. What was touted as Destiny’s calling card was its ability to fuse all of these elements – basically unheard of of consoles – into a cohesive game that can be accessible for fans of each genre. 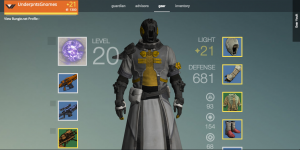 For the most part Destiny achieves this, but there are some very glaring issues too. The beginning of the review will feature some harsh criticisms of what I didn’t like, but I’ll progress into and end with what I found great about Destiny, so bear with me and the review. But first, let me walk you through the beginning aspects of the game to paint a bit of a picture of what you can expect. 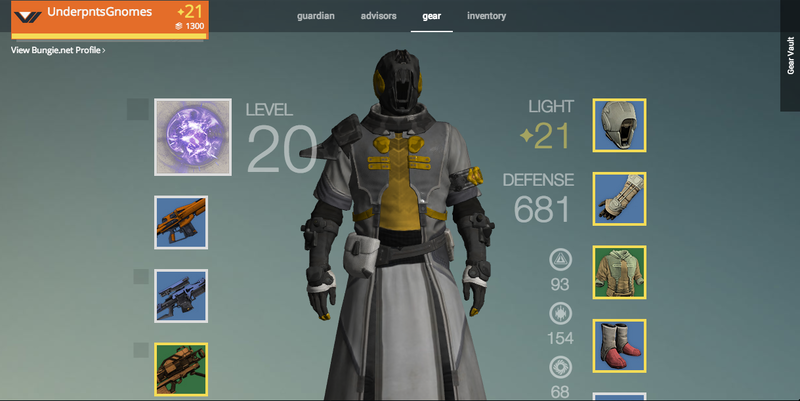 Full disclosure: I’ve put about thirty hours of play time into Destiny before writing this review. Once you’ve got your character (each with their own special class abilities) you’ll jump into the game. A cut scene will start and give you a basic – very basic – run down of what’s going on. All of the questions you’ll have afterwards – who’s the traveller, what’s the darkness, why are we losing a war when ghosts can just bring us back from the dead – yeah, those will never really be answered; at least not in-game (more on that in the next paragraph). Your ghost – a flying companion similar to 343 Guilty Spark in Halo – is voice by Tyrion Lannister Peter Dinklage. Unfortunately, the story and dialogue he’s given are just…terrible. Not even the great actor can save the dialogue from sounding watered down, forced and downright cheesy. It’s a damn shame that the developer who created a universe as captivating and deep as Halo could release such a drab and disappointing story. As you can tell, one of the most glaring issues of the game comes from the “story”. You’re given very vague details and despite progressing the story, nothing is ever really explained to you. You’ll meet new characters and even do missions for them – but their motives and backstories are never properly explained. 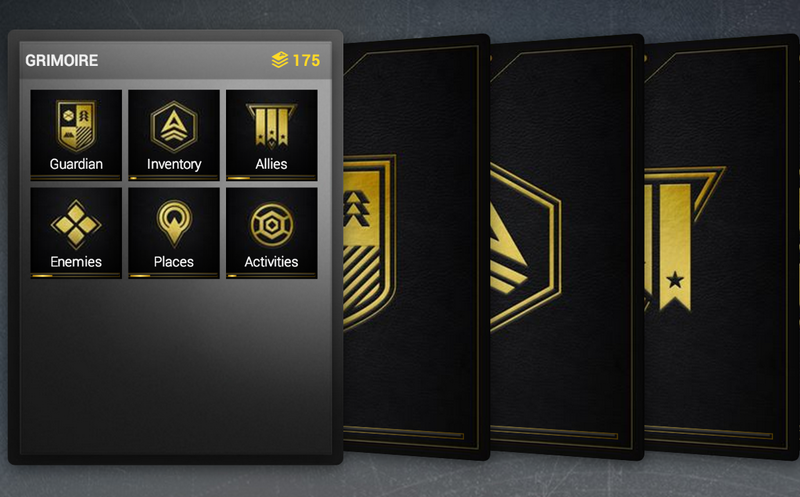 Completing certain tasks will reward you with grimoire cards. These cards will give you some more detailed background of the world of Destiny, but to view any of these you’ve got to either log in to Bungie.net or use the Destiny companion app. Neither of which I want to do after crushing a few enemies. If you want to give me a nice codex entry like Mass Effect, I’ll gladly read it. But forcing players to go to such obnoxious lengths just to get some backstory that should be in there in the first place serves no purpose but to break your immersion in the world. The only thing that rivals the terrible story is the repetitive nature of the games campaign missions. Every world that you’ll visit (Earth, Moon, Venus, Mars and The Reef) are each one map and every mission will take place on that same map, You might drop into a different part of it, but you’ll get bored very of seeing the same run down city over, and over, and over again. Each mission will task you with going from point A to point B and then deploying your Ghost to find out some random information. You’ll then be tasked with holding off a few waves of enemies (and perhaps a boss here and there, too) and then BOOM mission over. Then, rather then allowing you to continue exploring the world or going directly to the next mission, you’re forced to go back to the main screen to pick your next mission. While the campaign missions get boring quickly and are easy to get through, the strike missions are much more in line with what’s actually good about Destiny. These require at least one other person to beat due to the amount of waves of enemies and bosses you’ll face. They’re not much different from the regular story missions, but the added level of teamwork and difficulty make them a lot more rewarding and engaging. Upon conclusion of each mission, you’ll be rewarded with some loot. The loot ranges from weapons to armor, emblems and elements you can use to trade for weapons, armor, vehicles and emblems. Unfortunately, the loot you’ll obtain – in terms of quantity – pales in comparison to the likes of Borderlands. 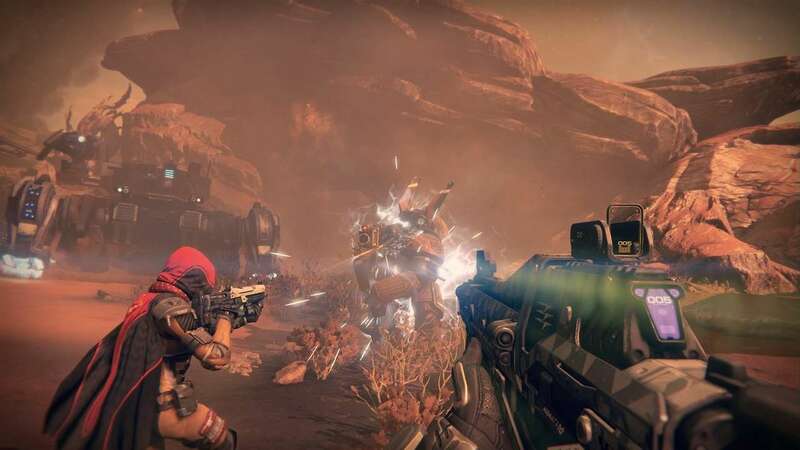 So, if like me, you were spoiled by endless and daunting amounts of loot from Borderlands, you’ll probably be disappointed by how much you’ll find in Destiny. Speaking of Borderlands, one of the biggest issues I had with Borderlands 2 was how quickly you’d hit the max level cap. After a full play through + a few hours, my friend and I had hit the level cap. Sure, we had a new game+, but playing without any promise of XP seems inherently pointless. So, while I wasn’t sick of playing Borderlands 2 at the time, playing for no reason eventually deterred me from playing it (at least until the level cap was raised a few months later). Destiny is plagued by a similar problem. My friend and I had hit the max level of 20 (that you can obtain from XP) before we’d even finished playing through the story. Once you hit level 20, you stop gaining XP and the only way to level up further is to obtain rare items that contain “light”. What is light, you might ask? I have no idea. All I know is that I need more of it, and obtaining it is pretty much a crapshoot. There was a decent farming spot, but Bungie announced today that they shut it down. Now we must wade through the endless futility and pray to the mighty Traveller that he bless us with some freaking rare loot. Now, my friend and I are forced to choose between either A. spending hours aimlessly playing through the same tired missions we’ve repeatedly played through multiple times in the hopes of finding rare items – that there’s no guarantee of getting – to try and level up or B. create a new character and start over. I love the character I created and don’t want to start over, but the futility of playing now can’t be ignored. I know there are plenty of you out there that live for grinding out rewards, but for a lot of us – no thanks. I don’t need immediate gratification, nor handouts, but the way they have the loot system set up now – it needs serious revamping or Destiny’s player count will drop as significantly as Titanfall’s has. Up until this point, you’ve probably been thinking to yourself “why the hell is this guy still playing if he hates the game so much?”. Well, it’s because I don’t hate the game. 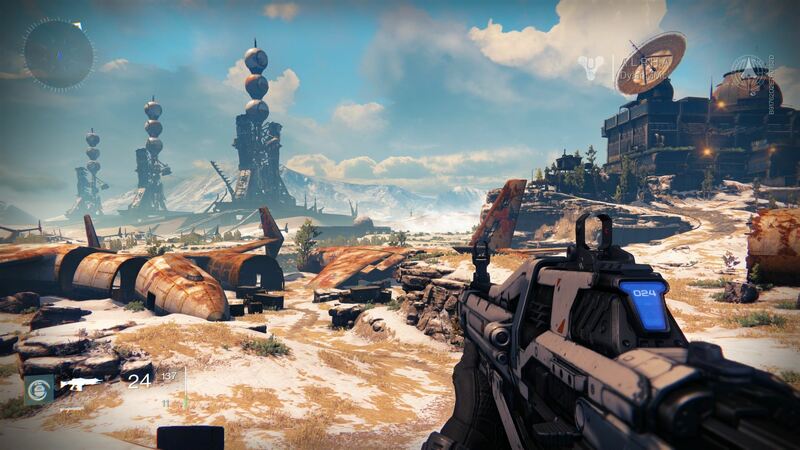 In fact, I love what Bungie tried to create with Destiny. The gameplay is crisp, fast-paced and fantastic and playing with your friends co-op is as good as it’s ever been. These reasons are why I’ve continued to play in spite of the games obvious flaws. While I primarily consider myself a single-player gamer, most of my truly great gaming memories involve co-op. 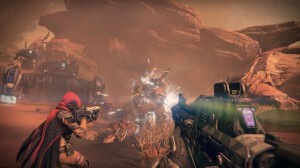 Destiny truly shines in its implementation of co-op. While you can choose to play through the main story by yourself, the world is always alive. As you’re running around the map, you’ll see other players running around you. It’s really, really cool. Even better is when you visit The Tower. As I stated in the character customization part of the review, The Tower is the only place where you can see the face of the character you created. 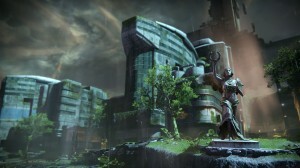 But even better than that, it’s the central hub for everything you do in Destiny. You’ll buy weapons, emblems, and vehicles as well as claim bounties to complete and have epic dance parties with friends and strangers alike (minus the music). As for the gameplay, it’s as solid and fast-paced as any FPS I’ve played. Weapons feel and sound powerful and even though you don’t get a tremendous amount of variety, when you find a weapon you like – you won’t want to give it up. I feel like a major badass running into a group of enemies, chucking a grenade in, popping some heads off with my sniper rifle and then finishing off their boss with my nova bomb special ability. With an improved loot system, more varied missions and a drastically higher level cap, Destiny could have been a strong candidate for Game of the Year. It still may be, but these issues are too daunting for now to ignore. Like many, I may be holding Bungie to a higher standard given how grounding breaking Halo was under their tutelage; perhaps to an unfair degree. Still, despite Destiny’s flaws, at its core you can tell what Bungie was trying to achieve. The final product may be disappointing given the hype that surrounded it, but it lays a solid foundation for Bungie to build on for the next iteration. I have faith that they’ll take complaints from fans and journalists alike into account and make Destiny 2 even bigger and better. + Graphics are also fantastic. + Enjoy the fusing of gameplay elements between FPS/MMO/RPG. + Co-op makes the game a lot more fun. + Dancing with random people at The Tower. - Every. Mission. Is. Exactly. The. Same. - Ambitious attempts to fuse different gaming genres, ends up feeling flat. - Lack of split-screen co-op. - Grimoire background information only being available out-of-game. - Disappointingly simple character creator.